One simple technique is the “Divide Your Plate” strategy. Making good food choices, eating appropriate portions and following some simple guidelines will help you achieve your weight-loss goals. Picture a dinner plate and divide it in half. Fill one half with vegetables and divide the other half into two quarters. 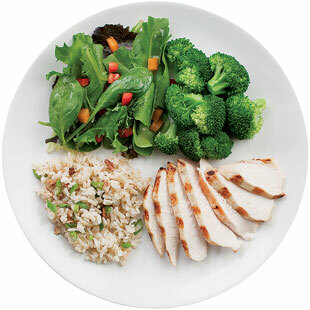 Fill one quarter with lean protein, such as fish, skinless poultry, lean beef, beans or tofu. Fill the other quarter with a grain-based or starchy side dish, preferably a whole grain like brown rice, whole-wheat pasta or a slice of whole-grain bread. If you focus on making most of your meals look this way, you’ll automatically be following healthy eating guidelines and choosing appropriate portions—without having to pull out a calorie counter or a measuring cup every time. Select a variety of foods in sensible portions. Consider no food either a magic bullet or a forbidden fruit. Choose whole foods over processed ones as often as possible. Embrace vegetables, fruits, beans and whole grains. Include low-fat dairy products, fish and shellfish, lean meats and poultry. Use herbs, spices and small amounts of olive oil and the other “healthy fats” to make food tastier, healthier and more satisfying.